Casio today announced the GPS-enabled Exilim EX-H20G pocket megazoom, which sounds as if it goes several steps further in geotagging capabilities than cameras we've seen this year from Panasonic, Samsung, and Sony. The new camera has accelerometers and motion sensors embedded within it--and they record location data even when the camera is turned off. 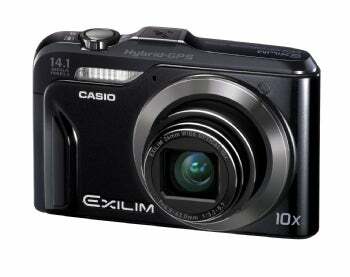 Casio claims that the Exilim EX-H20G is the first camera of its kind that can accurately geotag images taken indoors. Using the last-recorded GPS coordinates as a starting point, the new Casio camera's motion sensors calculate the distance and direction that a photographer has moved since the last connection with a GPS satellite, and the camera updates the location in the images' EXIF data accordingly. The EX-H20G's in-camera mapping software also sounds more advanced than competing GPS-enabled cameras. Besides being able to display images on a map interface on the camera's 3-inch LCD screen, the EX-H20G's in-camera mapping software is preloaded with points of interest; if there's a landmark or photo-friendly vista nearby, the camera will let the wandering photographer know where to go in order to snap a photo of it. The EX-H20G is also equipped with a digital compass and a database of location names, which display on the camera's screen instead of the raw GPS coordinates. In addition to the in-camera cartography, the geotagged images can be used with Google Earth, Flickr, Picasa, iPhoto, and Panoramio to create a shared, geotagged image map. Those in-camera bells and whistles sound as if they would drain the battery insanely fast, but Casio says the EX-H20G is a low-power-consumption device. We've seen recent Casio cameras that squeeze a jaw-dropping 1000 shots per charge out of the same rechargeable lithium-ion NP-90 battery that powers the EX-H20G, so the camera might actually be able to handle all the extra features. The geotagging features are certainly the main draw of the EX-H20G, but it also looks to be a powerful pocket megazoom beyond that. The 14-megapixel camera offers a 10X-optical-zoom lens that reaches from a very-wide-angle 24mm to 240mm telephoto, steadied by sensor-shifting mechanical image stabilization. Other notable features include a 360-degree panorama mode, 720p video recording at 30 frames per second, and Casio's green-screen-like Dynamic Photo toolset for editing and customizing photos within the camera. A promisingly vacation-friendly camera (thanks to its geotagging features and long-life battery), the Casio Exilim EX-H20G will be available in November for $350. 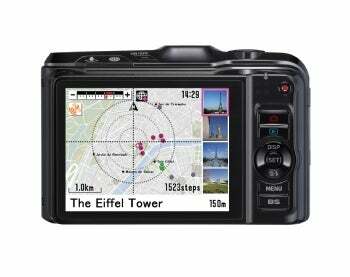 This story, "Motion-Tracking Casio Camera Goes Beyond GPS" was originally published by PCWorld. The vacation-friendly EX-H20G has a 10X-optical-zoom lens, great GPS features, and in-camera mapping. It's a top performer in daylight, but it lacks manual controls and a few key features.